National Nurses Week is an annual celebration that recognizes the value of nursing and educates the public about how registered nurses (RN) can advance innovation and improve the overall health care system. Nurses are an integral cornerstone of the healthcare system. This system, void of nurses, would lose a measure of humanity and operate less efficiently. A nurse's very presence elevates the level of patient care regardless of a patient’s age, race, religion or creed. They strive to better each establishment they enter and count it a privilege and honor to do so. The American Association of Nurse Life Care Planners (AANLCP) remains increasingly proud to be part of the nursing profession and recognizes all nursing disciplines as essential. From bedside nurses to legal nurse consultants, we all perform our jobs with integrity, accountability, and respect for human dignity. We are all one. In honor of national nurses week, AANLCP would like to encourage you to invite your colleagues to learn more about the field of life care planning- a hybrid of multiple nursing disciplines. The best way to accomplish this is by giving the gift of knowledge. 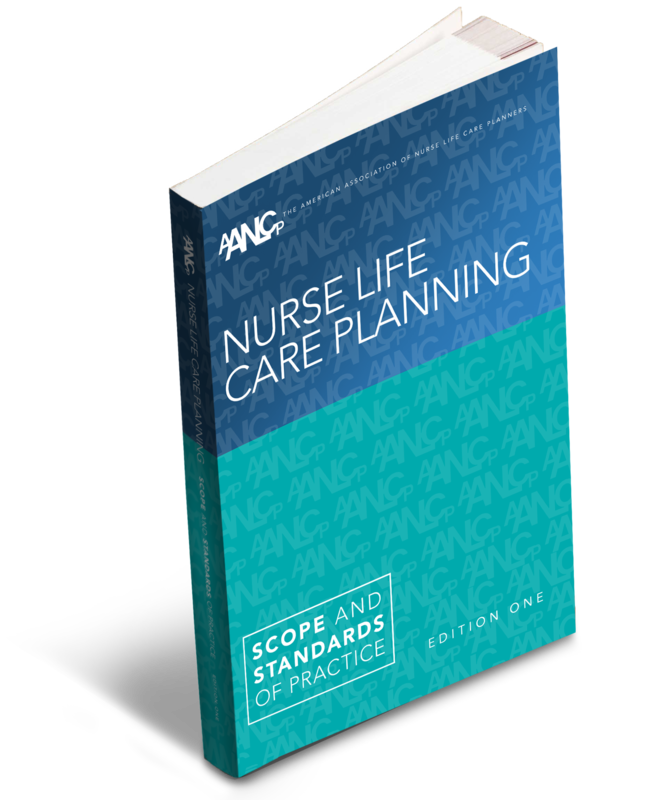 This week only, AANLCP is offering 10% off its Nurse Life Care Planning Scope and Standards of Practice when you use the code NURSE2018 upon adding this item to your cart. Already have a copy? You’ve witnessed its value first hand, get one for a friend! While this week is a special time to commemorate RNs, AANLCP is proud to recognize nurses for the care they provide 365 days per year. Just how impactful are nurses? Read the below anonymous entries from hospital staff, patients and clients who will highlight the important role nurses play in providing high quality care. "Your title is "Nurse" or "Health Care Assistant", but you are so much more than that. And I know who you are! Among all nurses, yes, I know you! It was you who gave quality nursing care for my dying husband with such amazing kindness and compassion. It was you who helped me to see things that I couldn't see - or perhaps didn't want to see. It was you who sat with me after tending to his needs - sat in silence when there were no words to express our shared grief. It was you who prayed with me and dried my tears. You touched my hand and comforted my spirit with your understanding heart.Yes, I know you! At first, your help was received with apprehension. There was reluctance on my part to give up my caregiving role to a stranger. And my husband - well, he totally rejected your services even though you brought gifts of compassion and understanding. He was so stubborn. No one was going to lift him from the bed but me. And certainly no one was going to bathe him!But you persisted. Each day, after his blood pressure check and your documentation of his physical status, you proceeded to create a bond, to open the door of his heart which had been tightly closed because of fear and regret. You became his friend, listening to stories I had heard a thousand times, but they were new to you. Slowly but surely, you gained his trust. He finally gave in to your gentle persistence and allowed you to bathe him and tend to his personal needs. Several months went by and your presence in our lives became a priceless gift. Because of you, I was able to relinquish some of the care giving tasks that had fatigued me over the previous two years when I was the only caregiver. Because of you...I could rest a bit and restore my body and my spirit. Because of you, I was confident that my husband was being cared for with dignity and respect.Soon you began to occupy a very special place in our hearts - a place of high honor. Perhaps I shall call you "angel." Yes! "Angel of Mercy" - "Angel of Compassion" - "Angel of Love." And then one day, in a serious and somber voice, but still in a whisper because of his weakness, my husband told me that he was in love with another woman! My heart sank. In that moment, I totally forgot that he was completely bedridden and unable to accomplish even the most simple of tasks for himself. He certainly was unable to leave the house and become involved with someone else! I was confused. Then he looked at me with an impish smile and confessed that the "other woman" was you, our Angel of Mercy, our Angel of Love. Over the days and weeks that you tended to my husband's needs and gave me a much-needed respite, he had fallen in love. Your eyes had met at first on the level of stranger to stranger, then caregiver to patient, then friend to friend. You both were devoted to making the best out of what was happening - his decline, his movement toward the end of his journey. On that last day, when you looked at me with tears in your eyes, I was able to know without words that the end was near. Because of you I was able to spend those last moments with him before the coma engulfed his spirit, knowing that the two of us - my husband's "new love" and I - had cared for him in an exceptional way. Yes, you were my caregiver friend. My husband and I were walking along a road not of our choosing. You gave us strength when our hearts were so strained. You nourished us with gifts of love and compassion. You listened to our cares and concerns. You touched my shoulder, gave a knowing smile, a nod of understanding. My heart was uplifted because of you. We became kindred spirits, you and I, upon the road unknown and I am so much better for having known you. It's been several years now since we shared those sacred caregiving moments. I'm not certain how it was that we said goodbye, or if we had the opportunity to really talk on that last day. Although we knew the end was approaching, things seemed to happen so quickly and I drifted through the moments without an awareness of what was said or not said.Did I ever really thank you - I mean really? Can you ever really know how much your presence meant to both of us? Oh, I know you had other patients, other families who probably fell in love with you! And you moved quickly, I'm sure, on to another patient, another family, to begin again the cycle of caregiving, nurturing, and loving. I guess it's never too late to say "thank you," but those words seem so inadequate. I wish I could find where you are and spend time talking with you over a cup of coffee. You would see that now I am strong and making a difference by giving back to the community of caregivers who gave so selflessly to me and my husband. I'd like to tell you what a difference you made. I'm sure you don't often receive the praise and recognition you deserve. You probably don't know that your patients and their families fall in love with you. Probably don't get to hear them say, "We love you." And so today I am writing this love letter. It comes with the utmost respect for your profession and the highest regard for the difficult tasks you perform each day, always knowing the end will come and you will move on to another assignment. It took quite a while for me to process my husband's illness and death and finally to make sense of it. I see it as a perfect plan to bring me to where I am in my life now - a caregiver advocate with first-hand knowledge of the roller coaster ride, the valleys of despair and the mountaintops of triumph. In my role as a caregiver advocate, I encourage you to be mindful of your feelings and accepting of the impact your patients have on your heart and spirit. Please don't deny the intensity of the mission to which you dedicate yourself. It is a mission sometimes without reward, but I promise that you are building a treasure chest of grace. Each of your patients is like a golden coin that is gently placed in this treasure chest, glistening with the sunlight that your presence brings into the lives of the sick and the dying - and their families. What an incredible contribution all nurses make to the sacred cycle of living and dying!" "I have had the opportunity to acquire services from exceptional nurse life care planners (NLCP) for over 20 years. I know them to be people of outstanding integrity- demonstrating superior personal and business ethics. NLCP’s work tirelessly, giving incomparable effort as they work closely with me to ensure that my needs were met. While looking at my global needs, my NLCP’s paid close attention to the smallest of details so no issue is lost. With their professional background in the nursing field, NLCP’s understand and demonstrate compassion, caring and the need for individualized services to everyone they serve. They are forthcoming, honest and truly bring a personal touch in their ability to interact with everyone. They address issues with open communication so that all parties are well informed of the options in order to make their own informed decisions. Should you be in a position to seek the services of an NLCP or an NCLP company, I highly recommend that you give them full consideration. I don’t believe that you’ll find a group of more qualified professionals to work with than nurse life care planners." "I have had the pleasure of working with nurses for more than a decade and it has truly been my honor. Nurses play a very important role in the healthcare system. Oftentimes, you might be the first interaction a patient has when they enter a hospital or clinic.Imagine a time you’ve started an IV and a patient becomes unresponsive. You handle this unpredictable chaos with the utmost agility, grace and professionalism. Nurses possess strength and accuracy to navigate rough waters during medical emergencies. But even those who provide the most compassionate care can have bad days too. Some days may seem physically exhausting and emotionally draining, but you let these difficulties be outweighed by the satisfaction of knowing that you play a pivotal role in the healing process. I believe nursing is a cognitively demanding profession where the task of care-taking is a rewarding challenge. Nurses go through some of the most intimate moments with people from all walks of life, and it is from these experiences that one develops an altruism towards humankind.Nursing is a passion for those filled with compassion. Two little words you may not hear every day are the appreciative and resounding words, “Thank you". Thank you for being on the front lines of care. Thank you for your kindness, dedication and healing touch. Thank you for always putting your patients first no matter how grueling your day. We thank you for providing an empathetic ear and compassionate hand when a life-changing diagnosis is delivered. We thank you for being a rock when waters get rough and we’re fighting for our lives. Although those two words aren’t voiced often enough, they should be."